The Brooklyn-based group Javelin is made up of cousins Tom van Buskirk and George Langford, who started making music together around 2004. They collect sounds from a variety of sources, both sampling other artists- many culled from their assortment of bargain vinyl- and making their own instrumentation for an eclectic, layered style, incorporating countless genres, loops, and ideas into a few minutes of music. It's a dancy, funky rollercoaster ride filled with fun surprises along the way. Their live shows involve a number of boomboxes tuned to the radio and improvisational rapping, resulting in an ever-evolving "sound" that can't be pinned down. 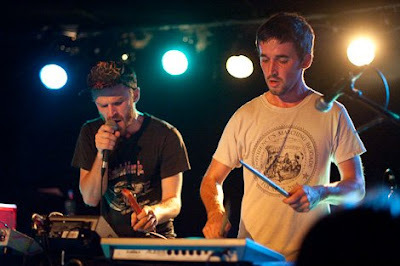 The duo released their latest album on Luaka Bop (David Byrne's record label) in 2010, titled No Más. Their self-released record Jamz n Jemz was listed as one of Pitchfork's "Albums of the Year" in 2009. You can download two of their mixtape mp3's below (right click and "Save as") and see some fun music videos! Javelin Music Video- "Soda Popinski"